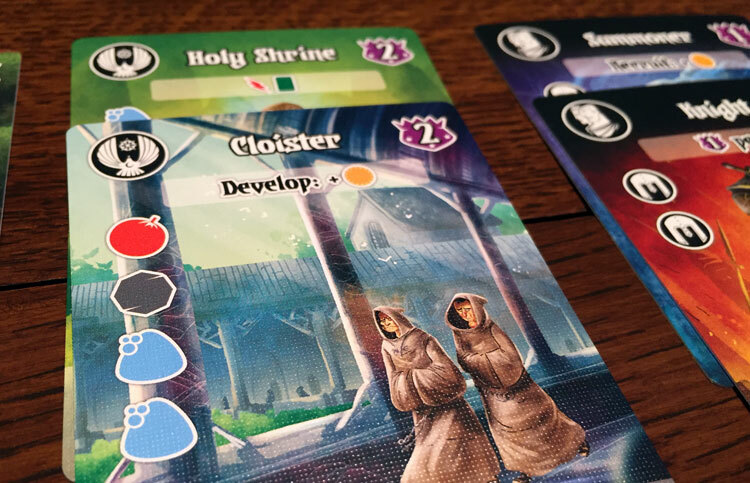 We review Villages of Valeria, the tableau building card game from Daily Magic Games. In Villages of Valeria players are trying to earn the most victory points by constructing buildings and recruiting adventurers. Despite its funny name, I really enjoy tableau building games. I like building things in general, and the tableau building genre allows me to grow something from its very small roots. 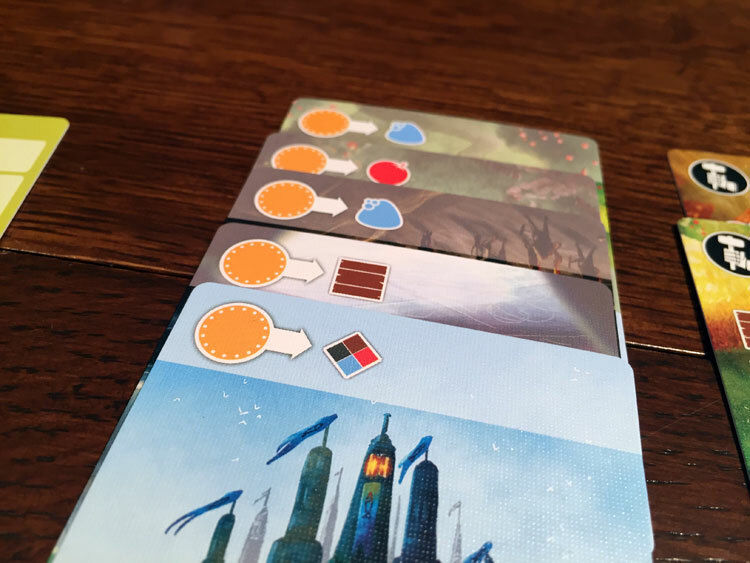 Regardless of their theme, tableau games like 7 Wonders, Imperial Settlers, or even Glory to Rome always seem to make their way to my gaming table. Publisher Daily Magic Games seems to have created themselves a solid group of games with their Valeria line. 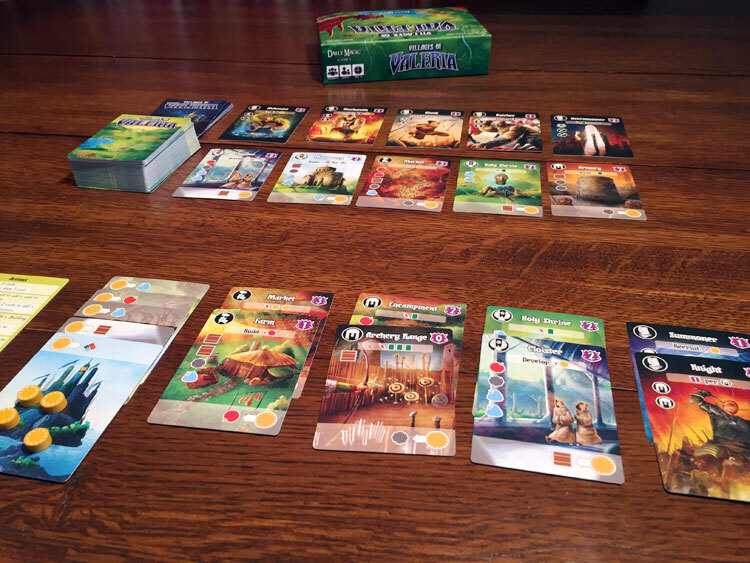 The first was Valeria: Card Kingdoms, a deck building game with a bit of a Machi Koro spin to it. 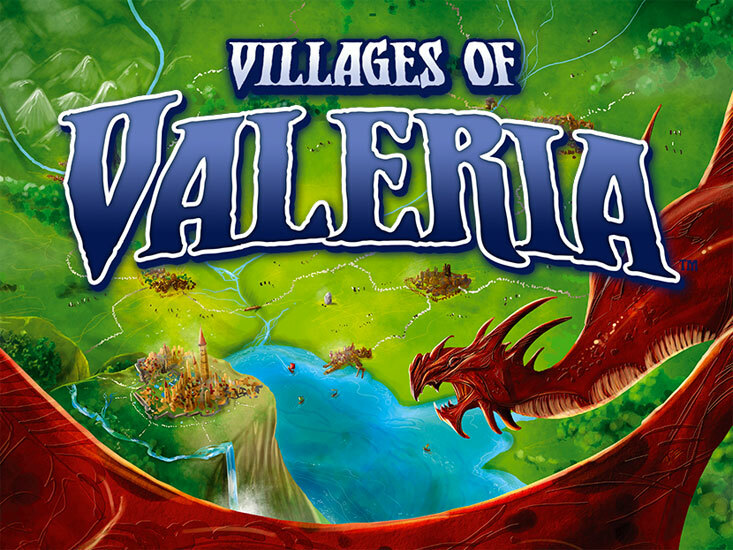 Today we are going to be looking at the next Valeria game in their line, Villages of Valeria. In case you haven’t guessed from the intro, Villages of Valeria is a tableau building game where players are trying to build out their village and attract adventurers. Villages of Valeria is a tableau building, hand management game for 1-5 players that takes about 30-45 minutes to play. Villages of Valeria plays well at any player count. In this village-building card game, players are trying earn the most victory points at the end of the game. This is accomplished by developing resources, constructing buildings, and recruiting adventurers. Players will be using the game’s 5 actions in a Lead-Follow mechanic to develop, harvest, build, recruit, and tax. In addition to points, many of the buildings and adventurers will provide special powers for the player to exploit, giving the game a bit of an engine building feel to it. Adventurers require specific types of building to be in your village before you can recruit them. The main components of Villages of Valeria are the cards, which come in two main types: the building cards and the adventurer cards. Most cards have a cost, VPs awards, and a special power it grants the player. They also feature thematic fantasy art that fits well with the game. The game comes with 30 wooden coins to be used to pay for resources. The other wooden component is a wooden castle to act as the active player marker. This should be used on the action selection card when a player selects their action. To be honest, we rarely used this as it wasn’t very hard to remember what action a player took. But I suppose it’s there if people need it. The rule book was fairly thorough; however I found it to be a bit wordy. The pages were filled with some pretty solid walls of text, which could be intimidating for players trying to learn the game. Thankfully, important text is highlighted in red. While the action selection card isn’t that useful, the player aids definitely are. I’m going to give you a high level overview of how the game is played here. For the full rules you can download a PDF of the rules here. Each player starts the game with 3 coins, 6 building cards in their hand, and a castle card, which provides one “wild” resource. Starting with the active player, each player takes a turn by first, refreshing their gold (removing it from their resources) and then choosing an action. Once they have selected their action, each other player can choose to follow or do nothing. 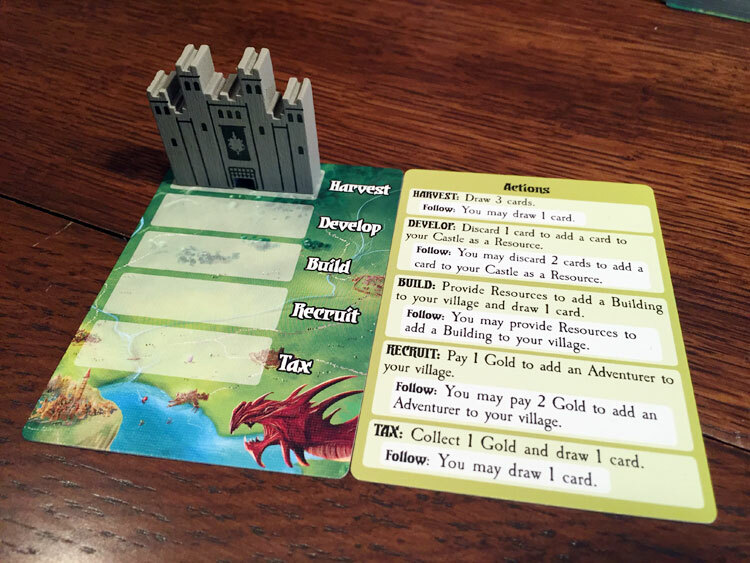 Build: Place gold on the required resources to construct a building from your hand and draw 1 card. Follow: Same as above, but do not draw a card. Note: When you build, you can place gold on your own resources or an opponent’s. Recruit: Pay 1 Gold to recruit an Adventurer. You must have buildings that match the adventurer’s required icons. Follow: Pay 2 instead. Many buildings and adventurers will have special powers that will provide resources, cards, or gold. Their powers range from one time, to use activated, to permeant. After the active player finishes their turn, the next player clockwise takes their turn. The game ends when one player has built the required amount of buildings and/or adventurers (based on player count). Players then add up their victory points and the player with the most wins. Players will be construction their village during the game, with new cards possibly granting them special powers. Villages of Valeria has a lot of things going for it. I had never played a game from Daily Magic Games before, but I came away impressed after my first play of Villages of Valeria. And further plays have only reinforced what a great little tableau builder they’ve put together. While the action selection mechanic, with the lead-follow gameplay is nothing that anyone would call ground breaking (it’s been done quite a few times before), I think it still works really well in Villages of Valeria. The actions all make sense and the follow penalty is fairly benign, usually just a small extra cost. I actually like how it works compared to other games, such as Glory to Rome, because it doesn’t require playing matching cards to follow. Anyone can use the action. Cards can be developed as resources to be used in the construction of buildings. This has a couple of benefits for the game. First, it creates swift game play. I’m not going to second guess building on an opponent’s turn when the only penalty is not drawing a bonus card. Second, I can look around the table and plan out my action based on what I think an opponent might do. If I see they have all the requirements to draft a good adventurer, I can make sure to take that action first, either snatching up that adventurer ahead of him, or forcing him to pay an extra gold (or use his own action to do it). And that’s where Villages of Valeria really shines, with its player interaction. 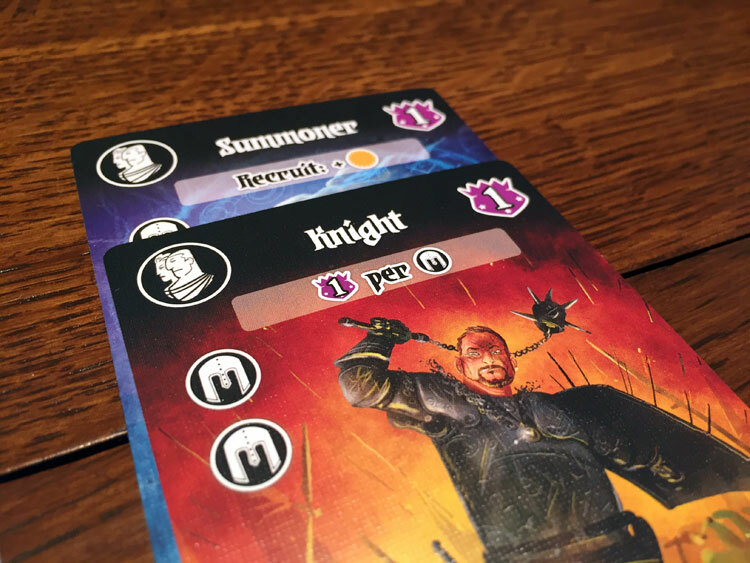 From the lead-follow mechanic, to some buildings that will have you plundering cards, to even paying gold, player and game action has them nicely intertwined. One of the great things about Villages of Valeria is that you can spend your opponent’s resources. The down side is they get to keep their gold you used. However their cards also don’t refresh until the start of their turn. So if you think they want to build, you can spend your gold on their cards, essentially blocking them from using it for the round. Even the discarding mechanic was a clever twist. There is no discard pile in Villages of Valeria. All discarded cards go onto of one of the building stacks. This lets you ether potentially save cards for later (sometimes you can even discard a card and immediately draw it back with a special power), or even block a building you know your opponent had their eye on. Each building requires a specific set of resources to build. I actually had a hard time thinking of things in Villages of Valeria that just weren’t working for me. If I had to nit-pick, I’d say that the Wizard adventurer feels a bit overpowered compared to the others. If he’s out in the initial draw, most of us will rush to be the first to get him. If he’s not, then I will make sure I have the buildings out for when he appears. This is probably less of a problem with the deluxe edition of the game where it includes more adventurers. However with only 16 in the standard game, chances are you will be seeing him appear. I thoroughly enjoyed Villages of Valeria from my very first play and it has made its way back to my table quite a few times since. I feel like the game play is easy enough for just about anyone to pick up, yet the game definitely has enough depth to keep even the most veteran of gamers entertained. Although if you start with the retail edition, I’d recommend picking up the expansion packs for added variety. There is also a deluxe edition, but I haven’t played that one so I can’t comment on the added value. However, even with just the base game, I found the replay value to be high, player interaction through the roof, and the game play mechanics are solid. While the lead-follow game play is a familiar mechanic, Villages of Valeria does a good enough job of putting its own spin on the tableau building genre and helps itself to stand on its own. I’m really looking forward to other offerings from Daily Magic Games after enjoying Villages of Valeria so much. If you’d like to pick up a copy of Villages of Valeria, you can get the retail version for about $25. 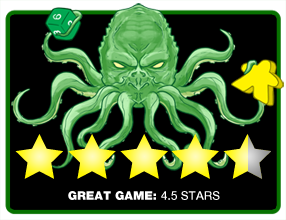 Final Score: 4.5 Stars – A great tableau building game with high player interaction and solid replay value.